Create comprehensive mobile forms with our feature rich, drag and drop desktop forms designer. Leverage over 15 different drag and drop Point types for data collection, to create comprehensive mobile forms. There is no need for internet connection when designing your forms as we use a rich desktop application to create the forms and you can just upload them to the server and deploy to your mobile devices when ready. The Mobile Forms Designer is a rich desktop client application that allows you to create comprehensive forms in an offline environment. The Forms designer allows you to eaily drag and drop different Points into a Project and create your forms in a simple to use environment. Choose from our large selection of points like the ones below when designing forms to create powerful forms. The Boolean Point is a useful facility for quick recording, providing a virtually unlimited choice of results recording, either text or numeric. The Selection Point is particularly useful where a number of choices are presented and multiple selections may be necessary. The Edit Point is used for entering text and/or numbers in the field. Standard Cut / Copy / Paste commands can be used, and Bar Code and RFID (radio-frequency identification) are accepted. The Drop List Point is useful for long text records for both single and multiple selections. 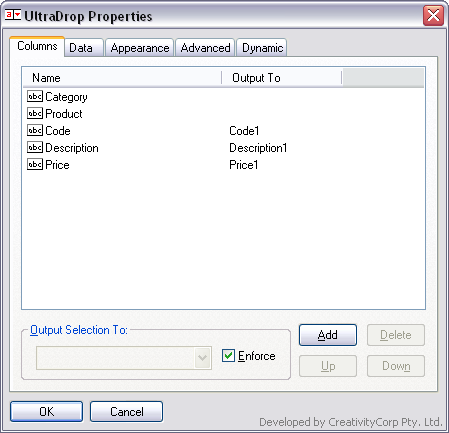 The Drop List is also a compact way of managing possible selections, with many entry box size options. The Date/Time Point is used to record the time (and date if selected) of a particular action or observation. The Date/Time point complements the timing functions of Mobile Data Studio which always record the time and date a new session is started and finished with a project/application. The time and date recording are a reflection of the settings on the host mobile device or desktop PC. Date Format options are available for regional preferences. Date/Time point accesses the calendar functions on the mobile device and desktop PC, and can record current and other times. Math Points allow a project to evaluate equations, drawing input from other data input points including Boolean, Selection, Edit, Drop List, UltraDrop, Logic, Date Time, and Math points themselves. Each Math point has a fixed expression associated with it that it will evaluate to produce a result. These expressions can include 30 mathematical Operators and Functions , some of which are shown in the adjacent image. The Numpad numeric keypad enables rapid entry of numbers using fingers rather than stylus. Tap pad icon to launch Numpad. 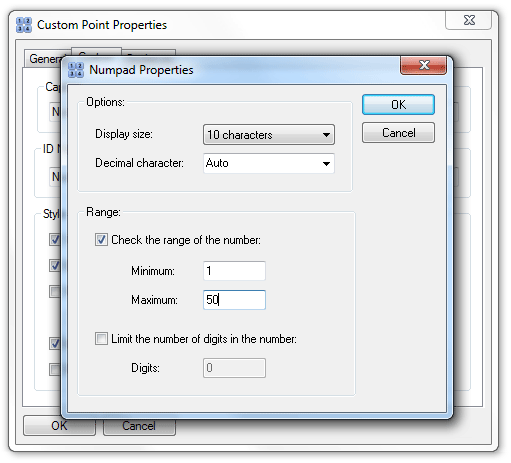 To support international use, in Design the Numpad has an option for Decimal character , based on either Auto (device settings), period/full stop, or comma. The Numpad point has a control in Design mode to set the range within which data can be collected, and to limit the digits in the number. Note that a period/full stop, or comma, is regarded as a digit; thus five digits could be 45.76. 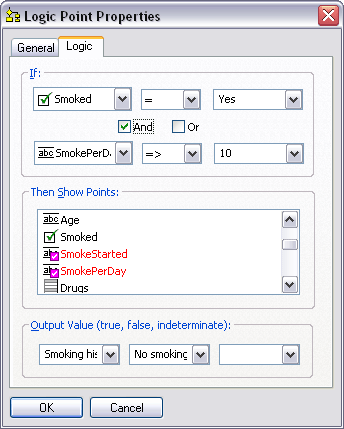 The Logic Point is a powerful function which can control display of points in a project, and output data, based on conditional logic criteria. The Logic points can be set up in Design to perform either or both of the display and data output functions. The Sketch Point enables drawing a sketch on the mobile device with a stylus. Sketches can be drawn in colour using either an 8 or 4 colour palette, or drawn in black. The Link Point establishes navigation links, as for web pages and sites. For lengthy projects, using the application on the mobile device is easier if the project is broken out into pages for each major subject area. For example in the Breathalyser project six pages were set up with the Breathalyser page presenting the top level navigation. The design dialog box below shows the simple procedure to set up a linked navigation point. In addition to being useful for top level navigation pages, links can be used on any page to make a quick 'jump' to a relevant area in the project, and back again. The link functions complement the standard Previous and Next navigation functions present on each project page on the mobile device. The Launch URL hyperlink can be used to link to the Internet, for example www.mobiledataanywhere.com or to a file on a mobile device if the location is known. The Layout Point enables either Images or Text to be presented on the project page, at any position. The Image Layout Point supports the insertion of JPG and Bitmap images . While the example shown here is a black and white identikit image, colour images can be inserted for maps, charts, plans and other requirements. Supporting guidance information can be added to the guidance box to elaborate on the image. The dialogue box for an image layout point is shown below. JPG images are generally small, whereas bitmap images are intrinsically large files, best prepared in 256 colours and 8 Bits format. Images may add substantially to the size of a project file. Formatter point enables pieces of information to be combined and formatted into a string, based on certain formatting parameters. This string is then made available to other points for processing (eg Math, Logic, plus Session List Columns and Session Identification) and for output via the Data Pathway. The File point , can be used to store a file within a session, to be extracted later, launched or output to another medium. Capture images alongside data with the versatile Camera point, using the convenience of Smartphone and Tablet inbuilt camera. If you already have an existing project structure that you can convert to XML, then you can automatically import it into the Designer to create the form for you.